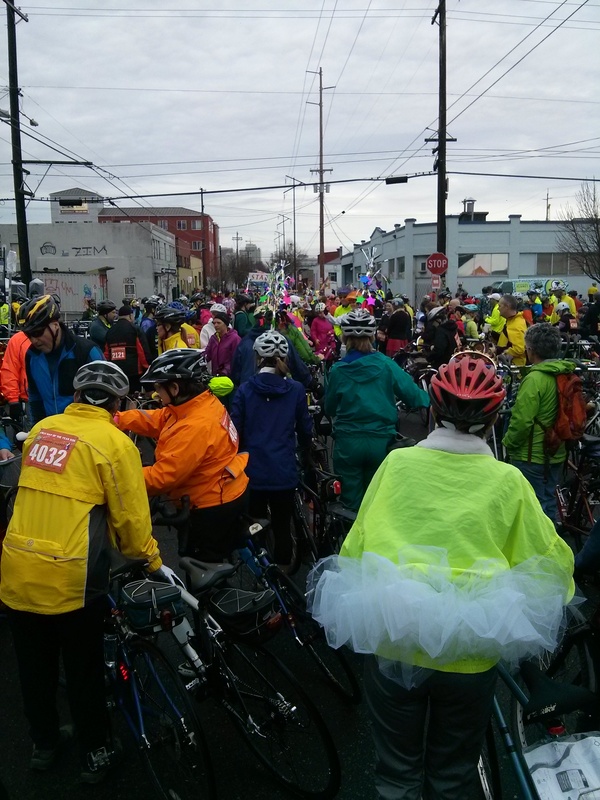 On Sunday, February 8th, nearly 3,000 riders – from wee to crinkly – celebrated the statistically worst weather day of the year by getting together in costume and pick-your-worst-weather-event bicycling armor. I’m a Community Cycling Center volunteer, curious, bike-lover, game for a challenge. I wanted a chance to say, “Take that weather!” and do it with aplomb like I see so many other riders do. Last year would have been my first Worst Day of the Year Ride (WDYR). As it turned out, WDYR actually coincided with the worst weather day of 2014. This year, the forecast called for rain and lots of it. I came into the 45-mile challenge route thinking the “challenge” referred to asking my winter-conditioned body to quadruple my comfortable riding distance of 10 miles. In January, I looked at the route map enough to notice we’d be riding west, crossing over the west hills twice. On the day of registration, I picked up the route map, folded it, and stashed it in my jersey pocket without even looking at it. The Challenge was on! Coming out of the Zoo, it started raining lightly and then a little harder. By the time I reached the REI rest stop in Hillsboro, the rain had stopped. ‘That was nothing,’ I wanted to taunt the weather-maker, but I was happy to have dry feet and keep them that way. I waited in the port-a-loo line right behind The Waffle with ‘syrup’ spilling down his helmet. Behind me, a rider commented to The Waffle, “You have my vote to win the costume contest.” To which I and a chorus of other riders agreed. “How long did it take you to make that?” I asked. “You don’t want to know,” replied The Waffle. The costume didn’t look thrown together. “Because it took a long time?” I asked. “A fork sticking out of the middle might break the wind,” I said. “It would be funny to go with someone dressed as a fork and have them chase me the whole way,” The Waffle said. “Make it for next year,” the guy behind me said. “It’s never beautiful,” someone else behind me said. Somewhere north of the rest stop, the road tilted up, wound, bent, up, around, curved, up, up, up to the point I could see – with some relief – sky on both sides of the road and then the road wound, bent, up, around, curved, up, up, up. It didn’t seem possible a road could do that – keep ascending with nothing visible to climb. I looked down expecting a flat tire to explain my slow, difficult pedaling and heavy breathing. But no, just my legs feeling like they were driving me through a road thickly coated in cold molasses. Without any fanfare, the road tipped down, around, bent, jogged, whipped, down, down, down. Then ended. I found myself on the St. John’s bridge, then passing through the Community Cycling Center rest stop on Alberta, and heading east on Alameda getting closer and closer to home, where I started my ride. At 53rd and Flanders, I decided I was tired, that the ride definitely challenged me, that completing both climbs without stopping was a satisfying accomplishment, that I’d already gone more than 46 miles, and I was so close to home. I peeled off the ride. 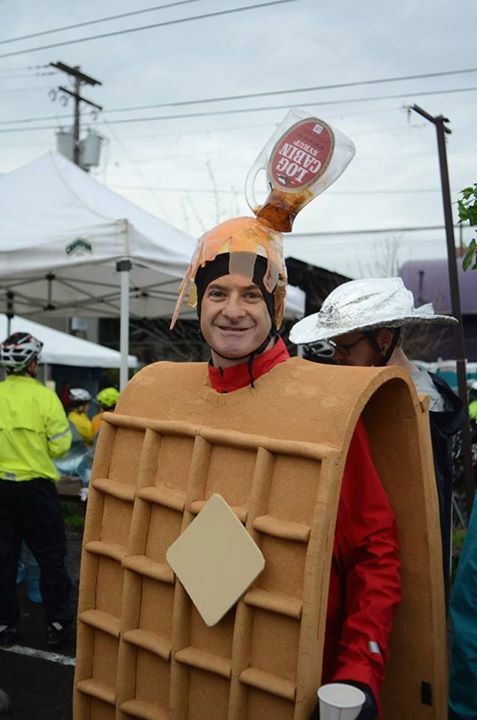 The Waffle, who’d been behind me, stayed on route to – I assumed – finish the ride and collect more Best Costume cheers. Thanks to all the riders who participated in WDYR. The ride is made possible through the generous support of sponsors and volunteers. Thank you all for the fun opportunity to get out and enjoy the weather and our fellow riders’ company. Consider extending the benefit of your WDYR registration and donate to Community Cycling Center so that the organization can broaden access to bicycling and its benefits all year long.